"Front of House" stills are normally a set of 8, same as US LCs. Window Cards are 14" x 22". 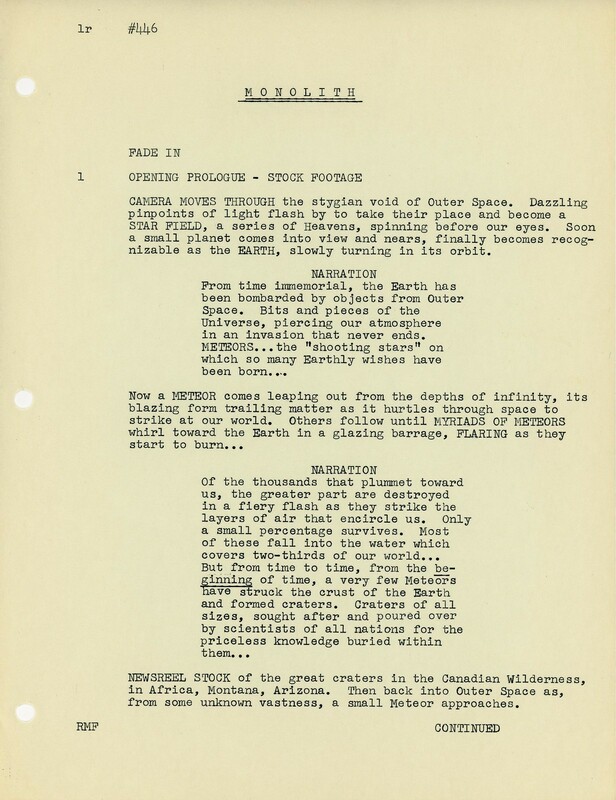 “MONOLITH” - Screenplay, Second Draft, November 5, 1956. 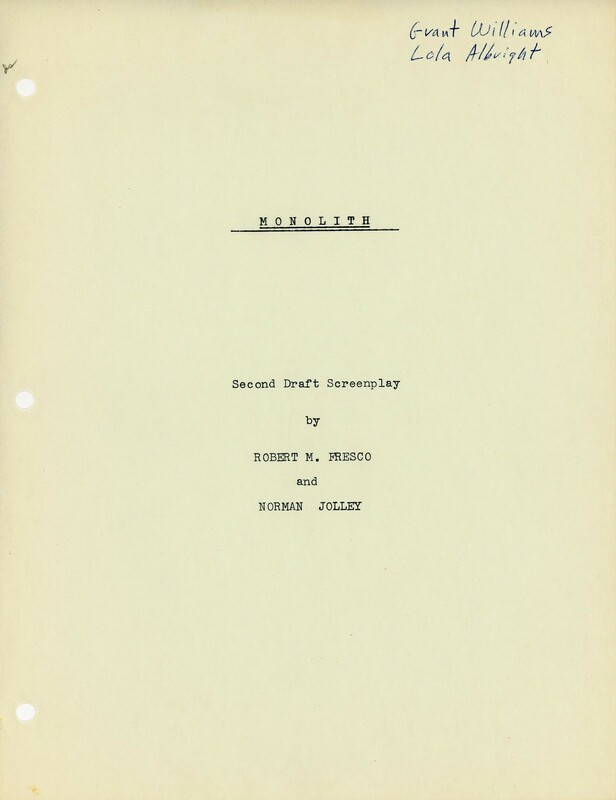 Got this original screenplay a few days ago. Just finished scanning the cover, the title sheet and the 92 numbered pages. Now I am just slightly less nervous about dumping a glass of tea on it or setting it on fire. This is either a file copy or was very quickly replaced with a Third Draft. It is in wonderful condition. Hard to believe it is 60 years old this month. 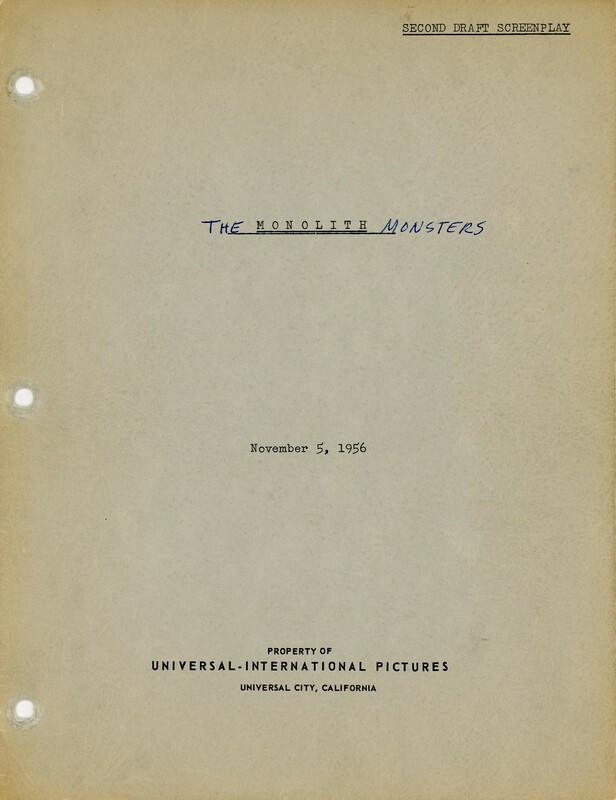 Printed under the working title “MONOLITH”, someone later hand printed the words “THE” and “MONSTERS” on either side in blue ink. The same hand printed “Grant Williams” and “Lola Albright” in the top right corner of the Title Page. There are no other hand notations in the Draft. At this point in the production, there are quite a few differences from the version that was released in December of 1957. The setting here is near the Salton Sea. There is no mention of a salt mine at all. 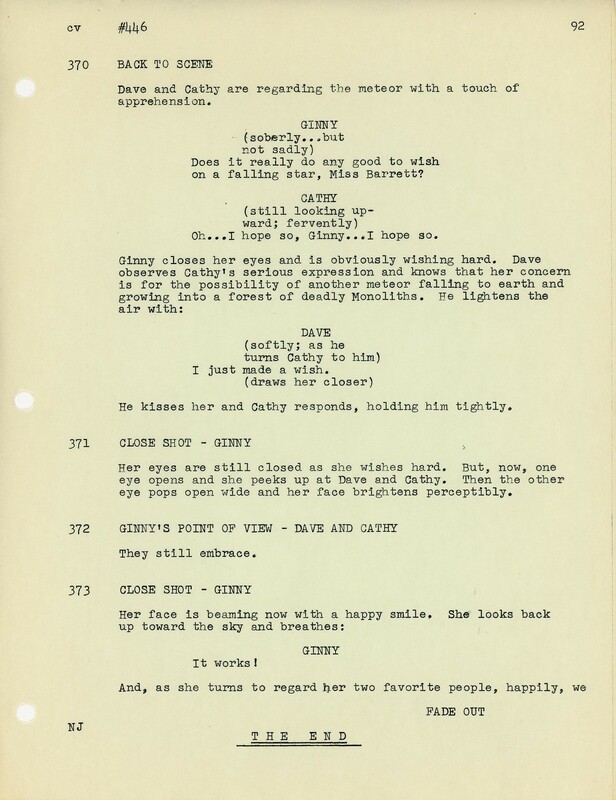 The Second Draft includes a character named “Matt Baker”” who is Dave Miller’s boss who was eliminated from the final film. Here Matt & Dave discover Ben Gilbert’s body together. Martin Cochrane’s part was later expanded to deliver some of the absent Matt’s dialog in the released film. A character designated both “Surgeon” and “Chief Surgeon” was deleted from scenes with Dr. Steve Hendricks. A lot of minor business and unnecessary dialog was wisely cut from the final movie. All the action in Courthouse Square is missing. No one else comes to town in a state of petrification, Dave Miller does not radio from a highway patrolman's car, etc. The ending is very different. 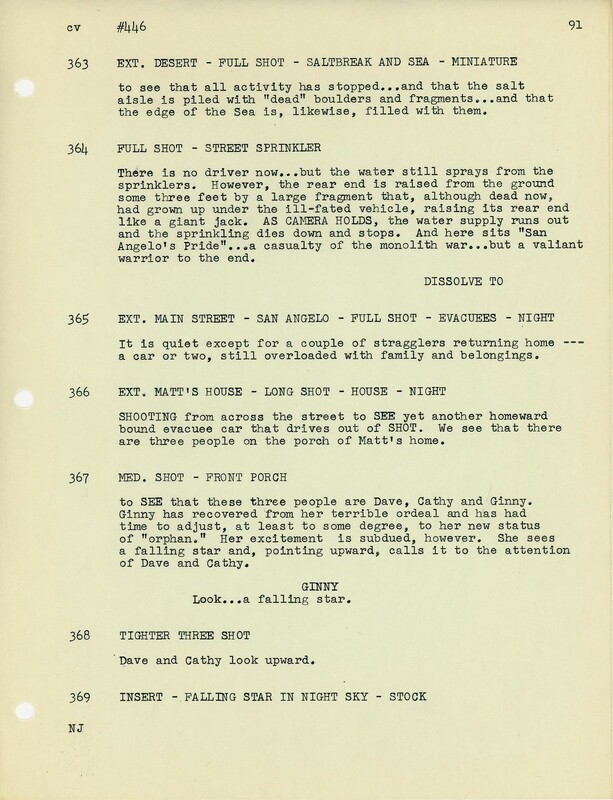 There is no “Bobby”, the newsboy, so that whole scene is deleted. Also, no evacuation notices are printed - so the “Printer” is missing. Instead, there was to be a lengthy montage of Ethel and two helpers calling everyone in town and people frantically packing up and leaving town. Cathy Barrett's character is more consequential. She provides helpful insight in a few plot turning points. These insights are taken away from her and assigned to others in the final version. That pretty much sums up what I gleaned from a first read-through. I will let the last two pages speak for themselves. See if you have the same “Hey, that’s an interesting idea.” reaction to Page 91 - and the same “Dummy, you just stepped on your own punch line!” reaction to Page 92. All illustrations here are of items in my personal collection. I have since upgraded a few yellowed pictures with nice clear B&W prints and replaced a TV promotional copy with a nice original studio photo. I didn't bother to mess up the chronology of my original post by deleting the first pictures from Flickr. I just moved them to another album. All the best examples can be found in alphabetical order in my MONOLITH MONSTERS Album under my Flickr name "monstersforsale". 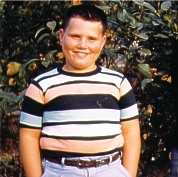 All 8x10 photos are copied at 300 dpi - nearly all with original studio snipes. Feel free to duplicate and use as you wish. 1849-P03 - Unknown Image) - This is the only image that remains a mystery. 1849-P07 - (Grant Williams) - Have Altered Copy promoting "Incredible Shrinking Man"
I hope Shout?Scream Factory also decides to do a nice Blu-Ray of Monolith Monsters for us. Does anyone here know how I can get a message to Tom Weaver? I would like to tell him that he can use any and all of my stills and my copy of the complete early draft of the script for any commentary or bonus materials - no charge whatsoever. I am not on Facebook. Hope someone has an e-mail for him. How did you come to know of Tom Weaver's interest if he hasn't contacted you? I don't know. He is just doing commentaries for a lot of the Shout BLU's. Thought I'd give it a try. I don't mind people reposting pictures from my collection on other sites either, so long that is as they mention that the items are from the collection of Hepcat. I’m a friend of Tom Weaver’s and he’s very interested in the use of your Monolith Monsters script. Please message me and I’ll get you in contact with him. Thanks! Personal Message sent - Check you e-mail. The previously unidentified young lady playing Dr. Henricks' brunette nurse is Carol Morris. She was Miss Iowa, Miss America and, in 1956, Miss Universe. Her speaking role is uncredited in the movie. I have identified her as "Nurse 1" and added her to the IMDb listings for "The Monolith Monsters". Dr. Hendricks also has a 2nd nurse who is uncredited. She is blonde and does not speak. Can anyone help me identify the actress? I've since seen Carol Morris on either "What's My Line?" or "I've got a Secret" (You can find it on YouTube) where she states that part of her beauty contest winnings was a 6 month contract with Universal. On the back of one of her stills for "Man of a Thousand Faces" the studio states that she was given a one year contract. I tend to believe her. It would have been much more important to her than Universal. I haven't read the entire UMA thread on MONOLITH but I see the photo of the girl in the iron lung and Grant and Lola and the nurse, but (skimming the post) I see the name Carol Morris. Carol Morris is the nurse in the scene where the little girl rallies and they start to take her out of the iron lung. The UMA photo is from an earlier scene where the kid is in a bad way, and the nurse in THAT photo is Laurie Mitchell, the Queen of Outer Space. Always happy to get the straight dope from someone more informed than me. - THANKS! Monolith Monsters officially arrives on Blu-Ray June 18th! Tom Weaver has been asked by Shout to do a Commentary. 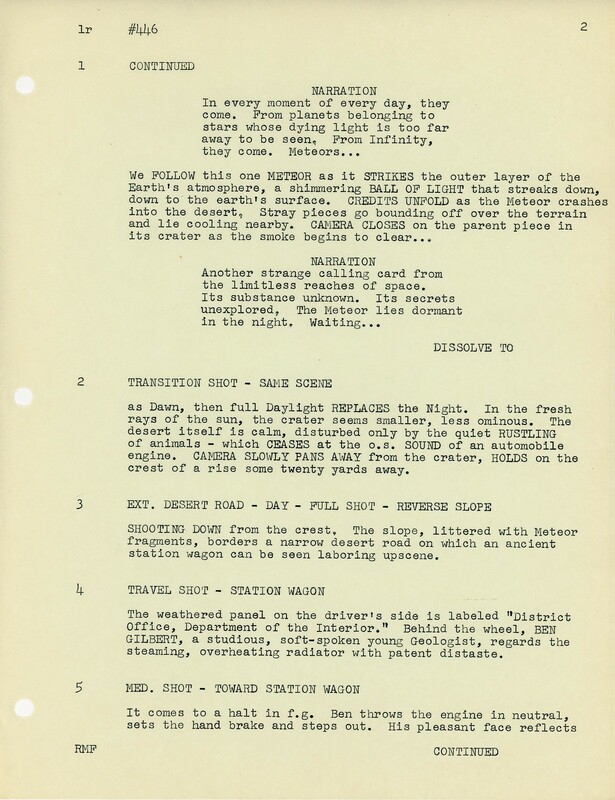 Will SHOUT include a page-by-page version of that 2nd-draft script? That's an incredible find, by the way. When that original ULTIMATE SCI FI COLLECTION came out as a Best Buy exclusive, all of those films were so crisp but MONOLITH was easily my favorite. And a completely new-to-me film, too. It remains one of those films that needs more big-screen festival showings. I haven't checked the IMBD page - have the many actor-credits been updated? Back in 2006 or 2007, when I checked again (I think this was when the combo collection DVD set was released), there were a lot of 'characters' that remained unlisted. It's great to see so many names attached to the supporting cast. All I know is I made it available. My hunch that it is a rare item was confirmed. I assume there are later/final draft scripts available. Do you have one?